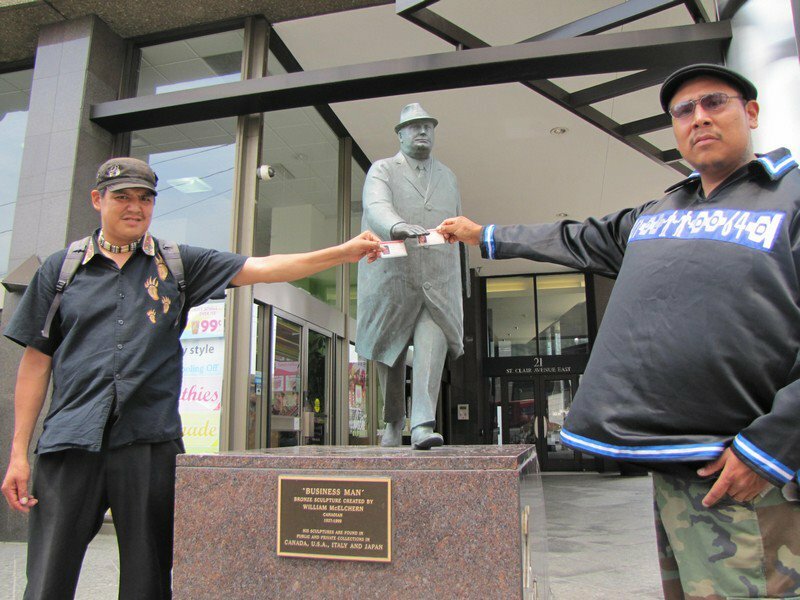 Oshki Camp Members Richard Peters and Johnny Hawke in Toronto Ontario Regional Branch of Aboriginal Affairs hand in their Status Cards and emancipate from Indian Act. Not to be mistaken as freeing the Crown from its obligations. Oshkimaadziig Unity Camp would like to extend a very heartfelt Chi Miigwetch to all our supporters who have helped to sustain our mental, emotional, physical and spiritual wellbeing since the lighting of this Fire. Your Prayer’s, Ceremonies, Donations, Knowledge and Love has been so influential into helping this Prophecy unfold. We are all the Seventh Fire People. We continue our reclamation at Council Rock aka Awenda Park and are very much determined to reestablish our Anishinabek Governance System, Emancipate from the Indian Act, Coldwater Land Claim Settlement and Uphold our Nation to Nation Agreements with the Crown. We are freeing ourselves from the System that destroys our Earth and who we are as Earth People along with the Illegal Colonial Policies that wish to see us Assimilated. For Those who support us “In Spirit” and who ask what they can do to help, We humbly ask that you keep offering your Semma, not for us but for our people and our Earth and those Future Generations. As we make this transition to re-establish ourselves as a Nation and utilizing our Territories to become Self Sufficient your Support is still welcome and very much appreciated. How You Can Help is, we would greatly appreciate any donations of: Gill Nets, Compound/Cross Bows, Hunting Supplies, Chainsaw, Tarps, Firewood, Non-perishable Goods, Trapper Tents/Tipi’s, Help in Organizing Events. If you would like to donate any monetary support so we can obtain these things we can do so by our Oshkimaadziig Camp Paypal Account. your welcome…anything else i can do???? ?